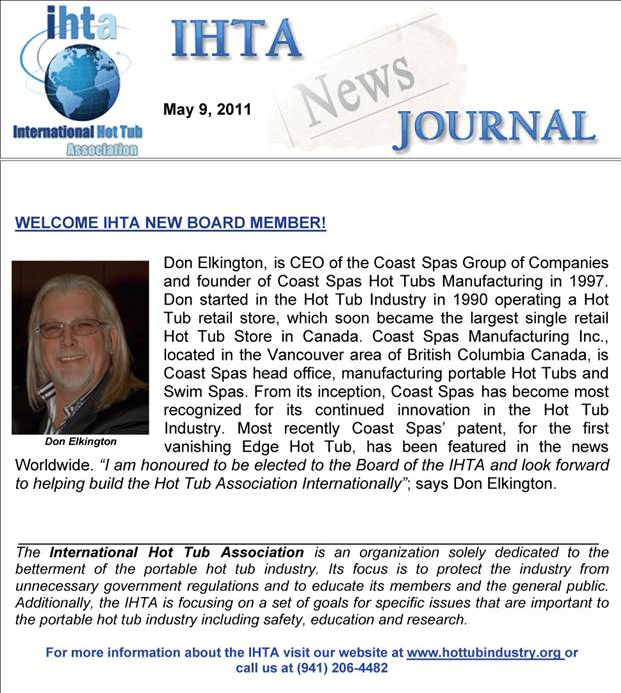 Congratulations Don Elkington – Founder and CEO of Coast Spas is Elected to the Board of The International Hot Tub Association (IHTA). Ensuring a high level of product safety is a matter of shared concern for both Coast Spas as well as its dealer network base globally. Following the successful completion of the International Electrotechnical Commission (IEC) and Electromagnetic Compatibility (EMC) product evaluation projects completed in March 2010, Coast Spas is very pleased to announce that it’s International Model Series line-up hot tub models were tested to comply with the most current version of IEC, EN, AS/NZS and EMC standards. Coast Spas use TUV and LabTest Certification, Inc. (International compliance) test reports to certify to CE compliances and Intertek (North American compliance) certification test reports to certify to CSA and UL compliances. Coast Spas TUV Certificate is internationally recognized by IECEE CB scheme (Conformity Testing and Certification of Electromechanical Equipment and Components), which is a national certification in all other countries of the CB scheme. The TUV has a reputation of being strict in their interpretation of standards and this adds to the credibility of our product. This is why TUV carries more clout than other agencies and why some people put greater emphasis on seeing TUV on a product than just seeing CE. The Intertek testing in North America conforms to strict UL 1563 for Spas, Equipment Assemblies and Associated Equipment and even more aggressive CAN/CSA C22.2 No. 218.1 for Spas, Hot Tubs and Associated Equipment.